Hawaiian Ginger Vegan Soap. Lovely scent, very floral yet beach fragrance to it. Coconut, mixed with flowers, honey suckle and Lillie's mixed in. All together you get what smells like a tropical beach side. 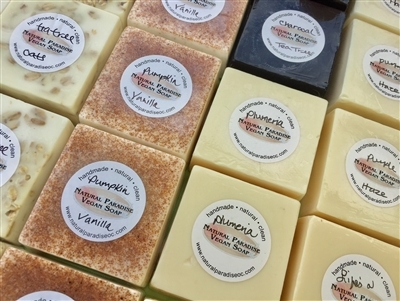 Island Soaps are made with the highest blends of essential or fragrance oils. In many of our soaps we have added “the real thing,” like flower petals, coconut, orange peel and seeds . Island soaps are handmade, come in all different colors. *Jojoba Oil - Reduces transepidermal water loss producing skin with suppleness & softness.